What is the Gender Links News Service? 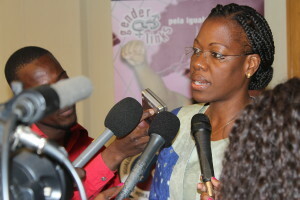 The Gender Links News Service, formerly known as the Gender Links Opinion and Commentary Service is an innovative multi-media project of Gender Links, a Southern African NGO that promotes gender equality in and through the media, to provide the media with fresh views and voices on current affairs. The service has its roots in the Gender and Media Baseline Study (GMBS), which showed that women’s voices and gender issues are grossly under-represented in the media. The service is not only multimedia and of regional relevance, but is BI-lingual, with news and opinion in English and French. The English service is anchored in Johannesburg, South Africa covering news from Botswana, Lesotho, Malawi, Namibia, South Africa, Swaziland, Tanzania, Zambia and Zimbabwe. The French service is based in Mauritius which receives contributions from DRC, Madagascar, Mauritius and Seychelles. To read stories from the service click here. The media is one of the most powerful forces for influencing societal attitudes and perceptions. As a contributor of the GL News Service, you have the opportunity to share your opinions, and stories with thousands of people across the region and beyond. Through your contribution, you are helping create communication for change that promotes justice and equality. Your work will be distributed throughout the SADC region to our subscribers as well as other media houses for republishing and rebroadcast. The media often call upon GL Service contributors for comment and often work is republished and rebroadcasted internationally on numerous online media platforms. All work is published on our website and on all our social media platforms like Facebook and Twitter. You can contribute using your preferred medium or any medium you specialise in audio, audio-visual and writing. It’s a good and easy way to get your voice heard, get your work out there and build up your portfolio. Subscribe to the GL News service. Download the GL News Service: Making ripples and changing lives, a qualitative look at the GLNS case studies. *When publishing articles from the Gender Links News Service, the Service must be cited.